take pictures of the places around me. There is the collection of photographs of clouds, flowers, friends and family, and the snow-covered valley beyond my apartment balcony — but many hours over the past year have spent in virtual worlds I've visited. In 2008, I played three video games that made capturing images easy. While I don't switch on Oblivion or Halo 3 very often these days, World of Warcraft's Azeroth has been a place I can call a kind of home. 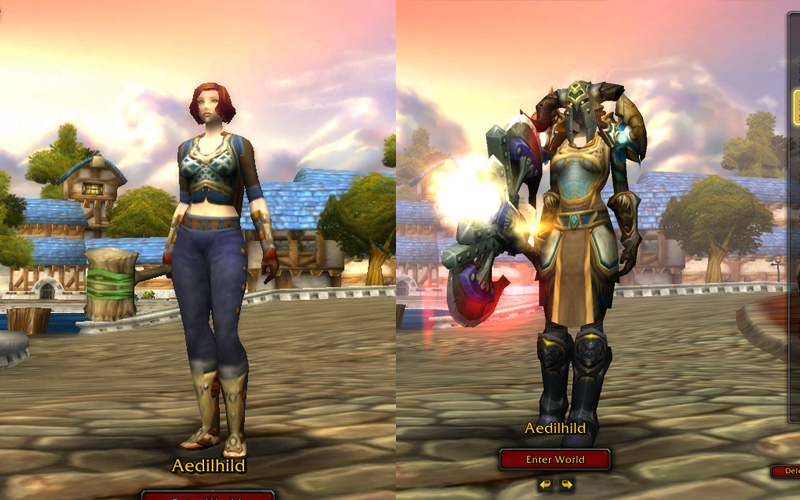 In April, I brought my main character, the paladin Aedilhild, to World of Warcraft's maximum level. Thankful to have had the presence of mind to record the first week of play — when I would quit a month later, not to return for almost a year — I enjoy comparing the fledgling, little crusader to her contemporary station as axe-swinging paragon. Note, for those of you unfamiliar with the human login screen, the mist swathed across Stormwind's canals in the background; a recent addition. In August, editors Jeremy Steeves and Ed Kirchgessner and I joined a raiding guild — a group of forty-some active players who organize in 10-man and 25-man teams to best some of the game's most challenging dungeons and encounters. 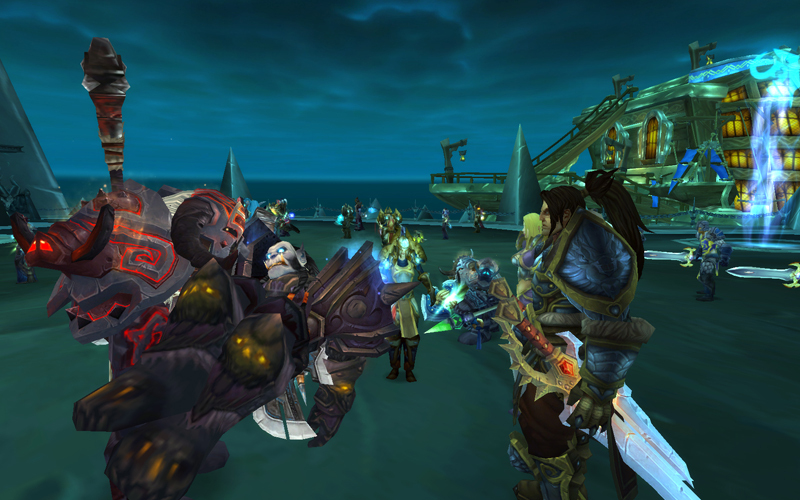 Nearing the climax of World of Warcraft's seven-year-old story and at the vanguard of forces rallied against Prince Arthas Menethil, the Lich King, we and our guildmates are witnesses to triumphs and passions. Here, a lord of the orcs reclaims the body of his warrior son — killed, raised and turned by the Lich King, only to fall to our league of twenty-five heroes. Of course, it isn't all valor and glory — this is a game, and snafus happen. 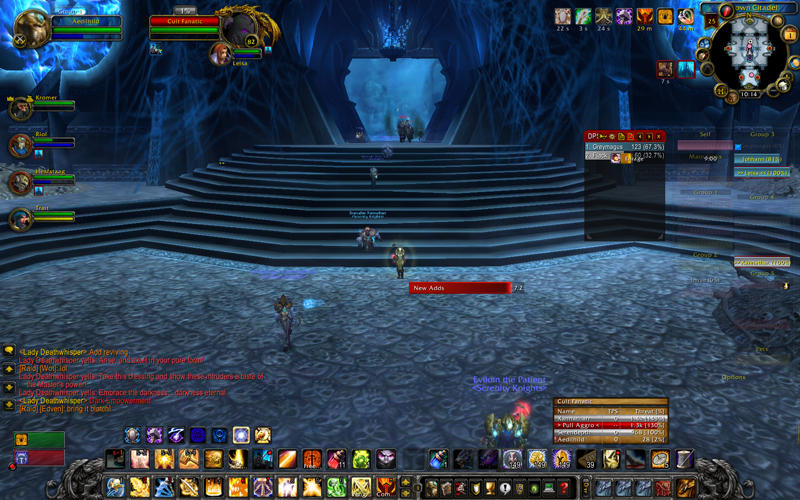 After losing an encounter with Lady Deathwhisper, raid members stumbled into a battlezone that hadn't reset, sending those of us with a head start to run as fast as we could to the entrance, the undead soldiers we had come to defeat right on our heels, instead. 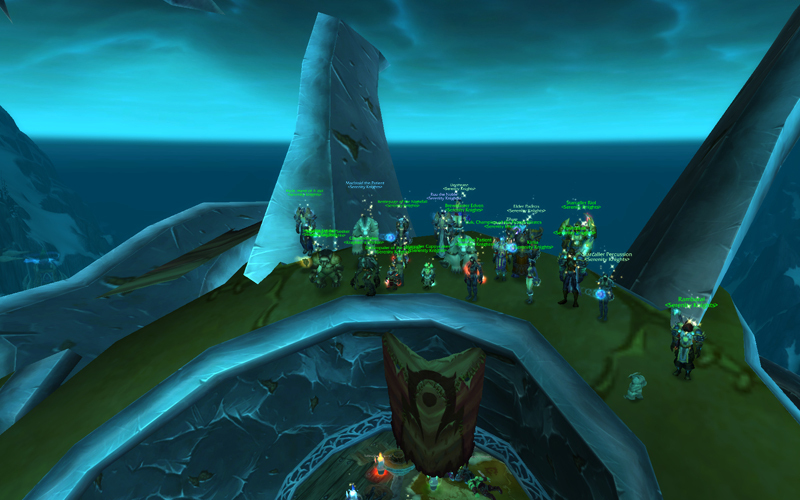 Nor is our playtime always as serious as raiding — not at all. Guildmates are calm and sanguine; the guild leader as cheerful and puckish as they come. While Ed, Jeremy and I had no part in the founding of the guild five years ago, we were invited to celebrate its anniversary, so near Christmas, the traditional way: a gift exchange, a scavenger hunt, and the taking of the Horde's flagship zeppelin as a prize. The guild is known to cause international incidents. A couple of months before, we swaggered into each capital city of the Horde and deposed — at least until respawn — the enemy faction's leaders. 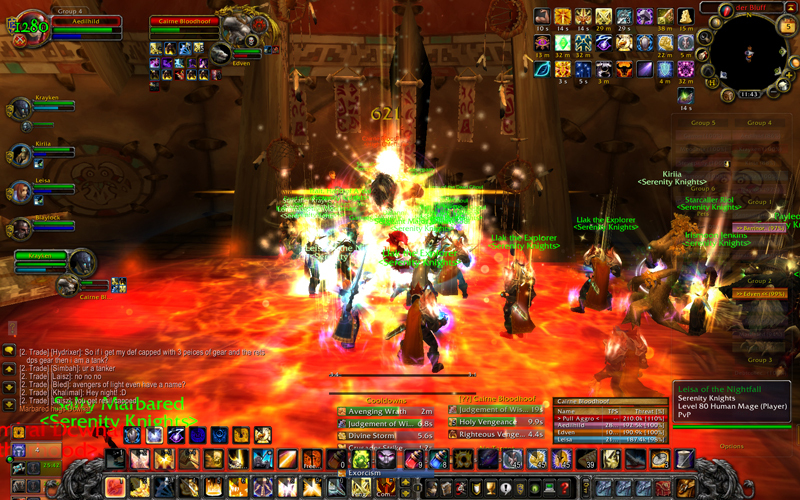 Cairne Bloodhoof can be seen, here, receiving an incendiary vote of no confidence. 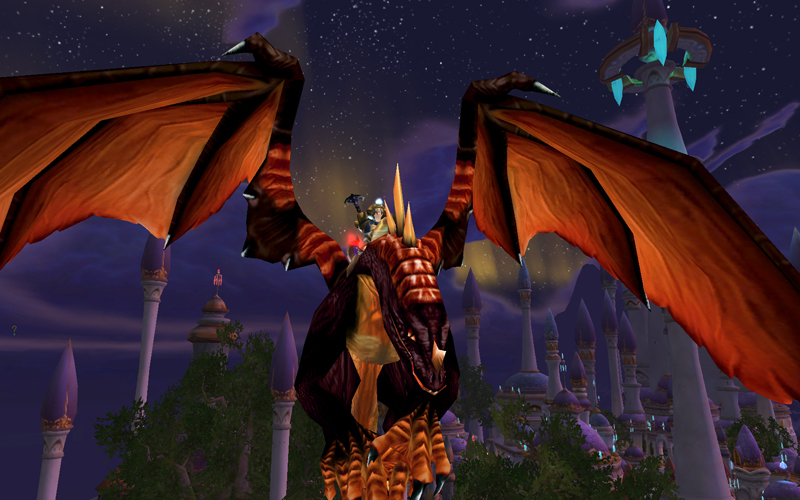 For such an aged game, World of Warcraft retains a unique beauty; not exquisite, but instead simply incomparable. 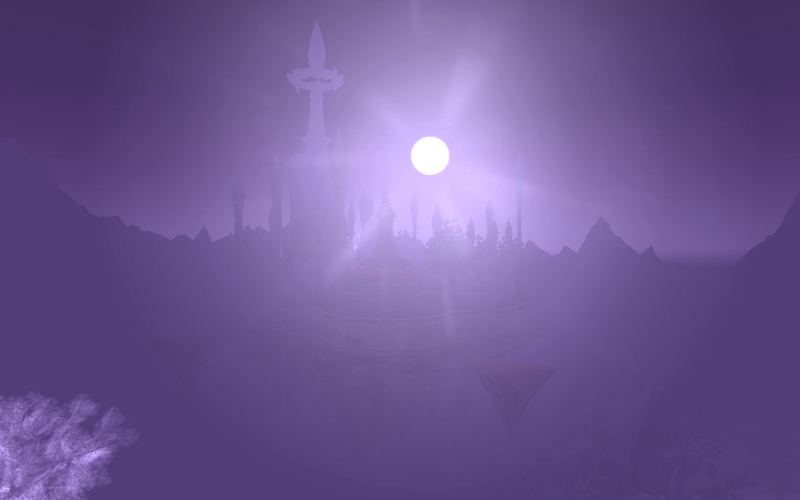 The sun hits Dalaran, floating city of the Kirin Tor thaumaturgists, only from here during these few moments of the day. 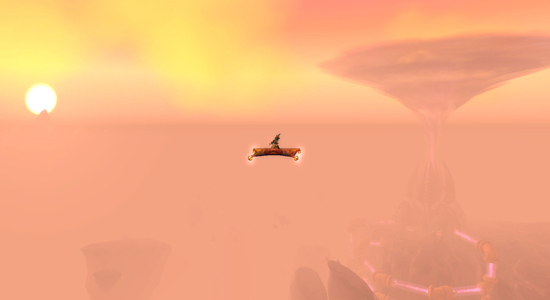 Aloft in Dalaran, there are primal and natural wonders above . . .
. . . and earnest brotherhoods below. Secrets in remote corners of a mastodonic world remain. 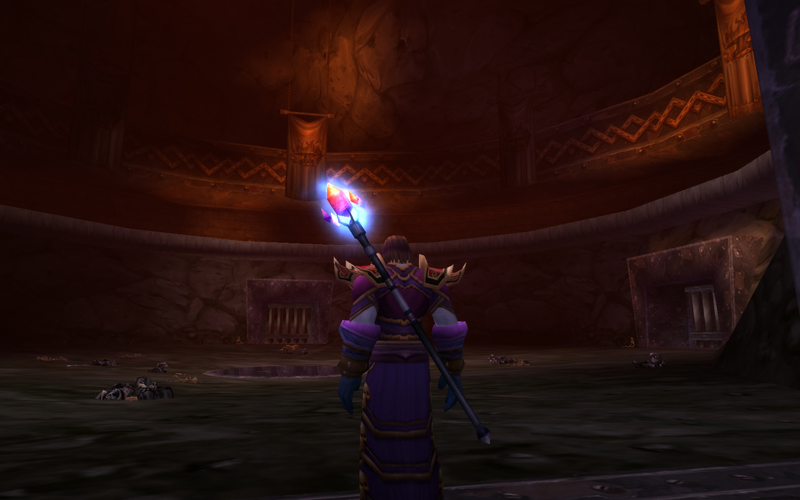 Playing my aspirant warlock, his namesake Ireland's legendary king Matholwch, I scoured the great mountainside city of Blackrock Depths — old content from the game's original release. A year or so ago, Jeremy and Ed and I traversed the place. But just this week, with a randomly chosen group via a new Dungeon Finder matchmaking system, I had the fortune of meeting four experienced, friendly, and capable players. We completed the instance, start to finish — pausing, toward the end of our conquest, in this magmatic crevasse. 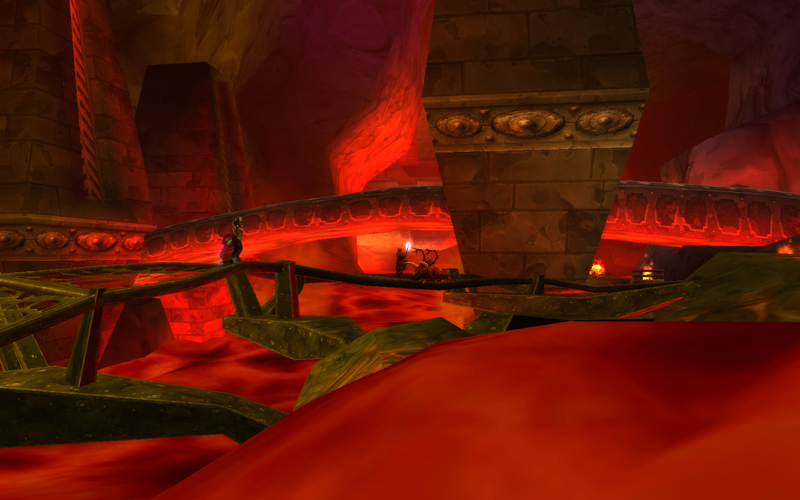 I have always found World of Warcraft immersive, but this left me spellbound. The group broke up after we said our goodbyes, but I stayed behind, walking alone through Blackrock's corridors as I mused. Such an adventure! 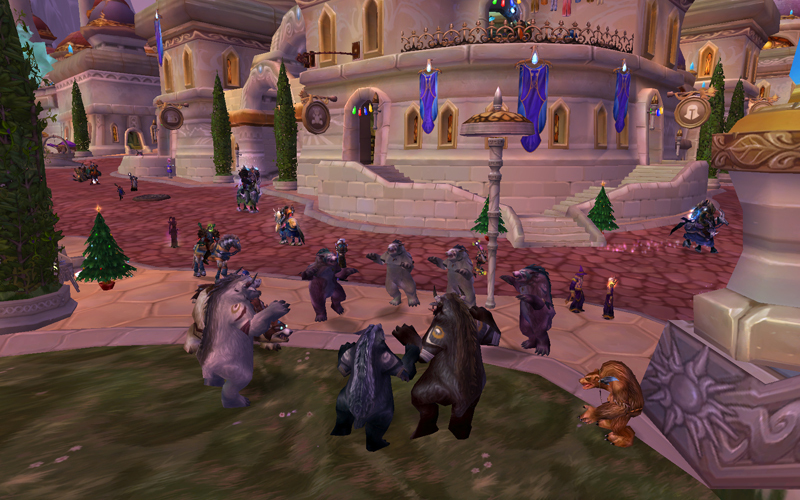 Oracles and bean-counters say that the next expansion, Cataclysm, will be released as early as July. Then, the Methuselah dragon Deathwing emerges, bringing tumult, uproar, sturm und drang; and the call for heroes will go out. For now, I have my favorite champions and records of their deeds.